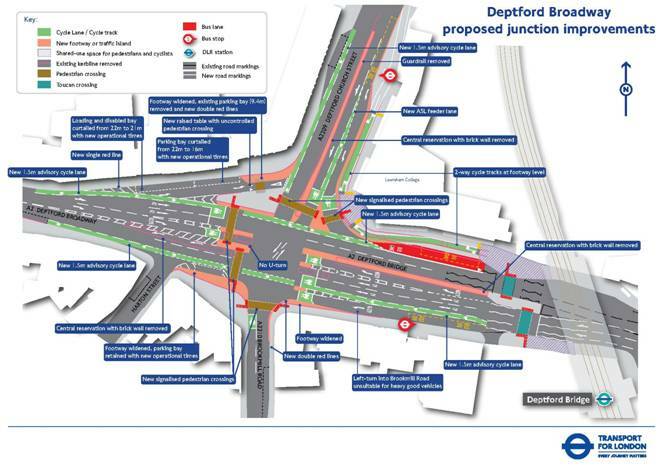 Transport for London's consultation on proposed changes to Deptford Broadway closes next week (12 December). This is a stretch of road so dangerous it’s provoked media campaigns. Between 2008 and 2012, five cyclists were killed or seriously injured on Deptford Broadway. Unfortunately, the proposals do little to improve things for pedestrians and they’re even worse for cyclists. Rather than offering the protected space for cyclists this road clearly needs, the only cycling ‘provison’ is sections of advisory cycle lane on the A2 and on Deptford Church St. Advisory lanes on busy junctions like this have been repeatedly shown not to protect cyclists from large and fast-moving traffic, and offer a false sense of security. Where segregated cycle track is proposed, it replaces existing segregated track outside Lewisham College – which is currently little used. In the current proposals, there’s no protected space for cyclists on any arm of the junction – there are left hook risks in all four directions. Approaching the junction heading south on Deptford Church St, cyclists are expected to merge with heavy, fast-moving traffic into an unprotected ‘ASL feeder lane’, leading to an advanced stop line which offers cyclists no advantage over the traffic behind. An ‘early start’ signal for cyclists could go some way to giving cyclists a chance of beating traffic across this large junction – though cyclists heading straight ahead (which most do) at peak time will then encounter an equally unpleasant cycling environment on Brookmill Rd, where cars are constantly parked in bays on this narrow road. While it’s good to see that TfL are finally acknowledging that pedestrians might want to cross the junction with the provision of new signalised pedestrian crossings, it won’t be quick – pedestrians crossing on the west and northern arms of the junction will have to cross in two stages, and there’s no crossing on the east side of the junction at all. TfL say a signalised crossing on the east side was considered, but “rejected on the grounds of junction capacity and low pedestrian flows” (the latter being a direct result of how hostile the environment is currently for people on foot). All in all, it’s incredibly disappointing – particularly as LCC’s local group in the area, Lewisham Cyclists, visited the junction with three of TfL’s engineers and fed back what improvements need to be made – feedback which seems to have been ignored. Lewisham Cyclists have responded to the consultation and met with Transport for London to discuss their concerns. Lewisham Cyclists make the point that the junction is a great candidate for cycle segregated junction treatment, which removes the risk of cyclists being hit by turning traffic. You can read their response on their website. Please tell Transport for London the plans aren't good enough - you can respond to the consultation using TfL's online survey, or email consultations@tfl.gov.uk. If you're replying to the consultation by email and you're happy for us or Lewisham Cyclists to use your comments, please copy your response to campaigns@lcc.org.uk.